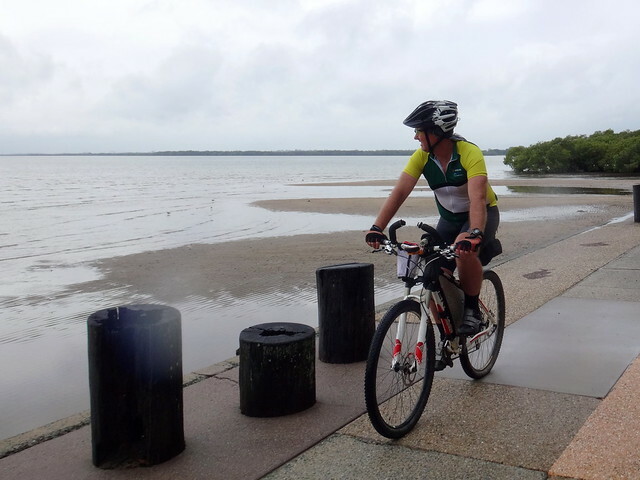 Early on a rainy Saturday morning, we set out along some local bike paths. 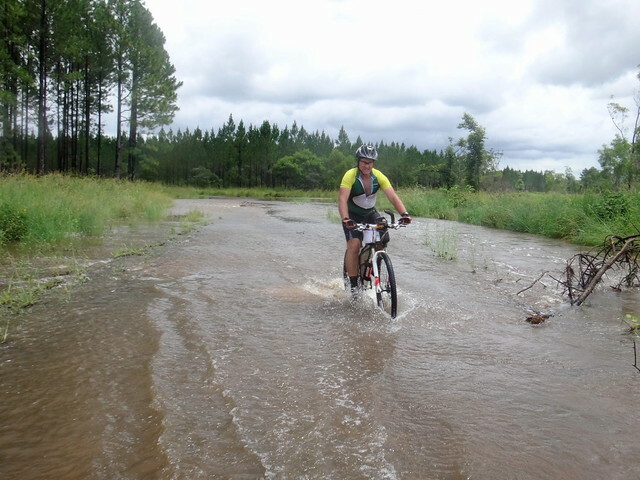 We weren’t sure what the weather was going to do, or if creek crossings would be impassable as we rode north, but we agreed to be flexible and tailor our course to suit the conditions. The simplest approach in weather like this would be to stick to bike paths for an hour or two until the weather cleared. 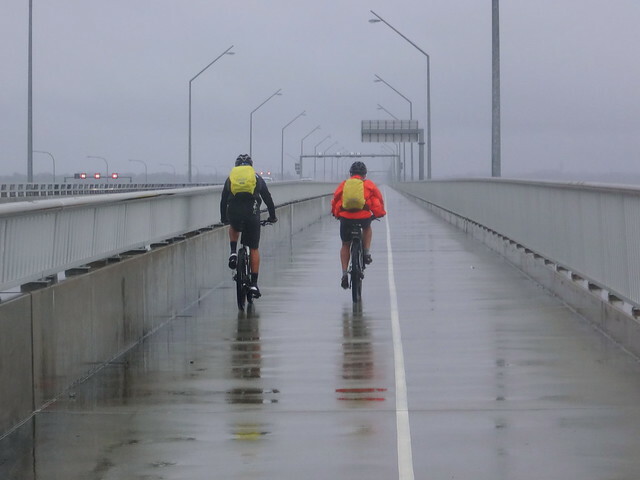 The tide was abnormally high as we passed through Deception Bay: the water levels in some creeks might be higher than normal, but the light drizzle had stopped and we were hopeful that the day would clear. 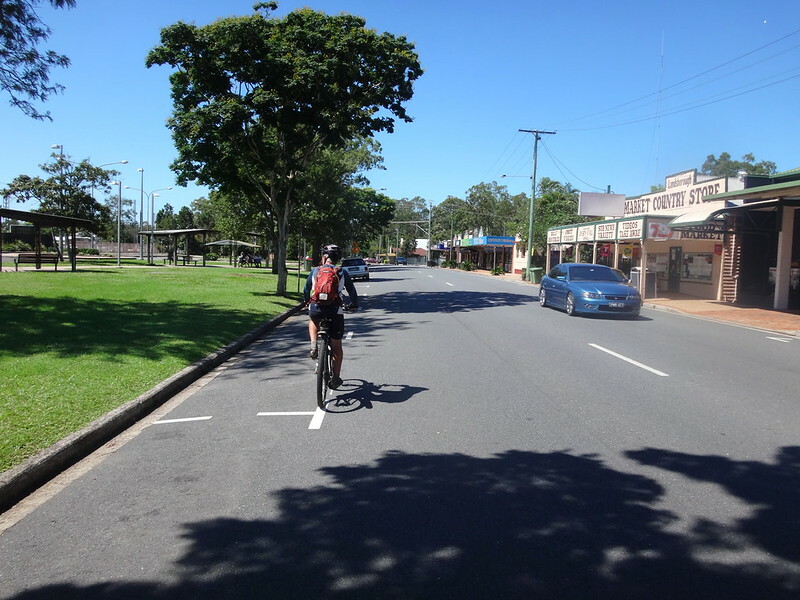 The least enjoyable part of a bike ride to the Sunshine Coast is having to deal with the heavy traffic in Morayfield. 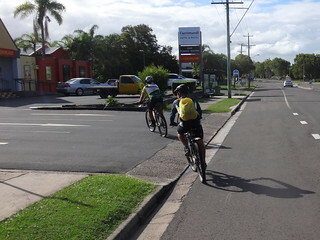 This time we avoided most of the traffic by riding through some pleasant tracks near the Caboolture Aquatic Centre, then zig-zagging through some local back streets. That way we totally eliminated the need to travel on any of the busy roads in that area. 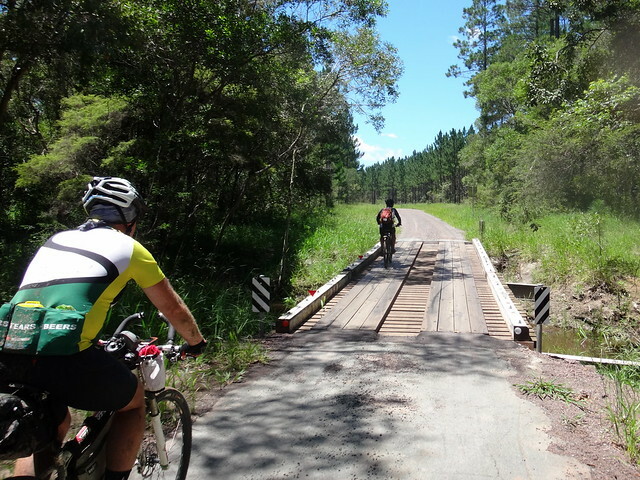 As we left the bustle of Caboolture behind us we rode north-east towards the pine plantations on the other side of the freeway. We let out a few “whoops” as our tyres splashed on the soggy tracks. 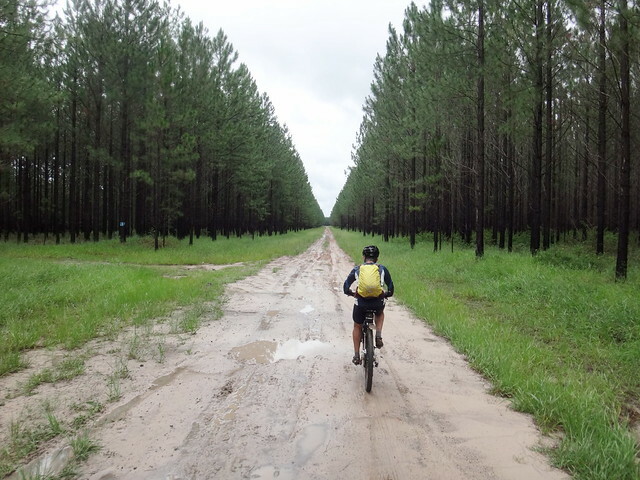 It was a pleasant feeling to immerse ourselves in the seemingly endless forest trails. 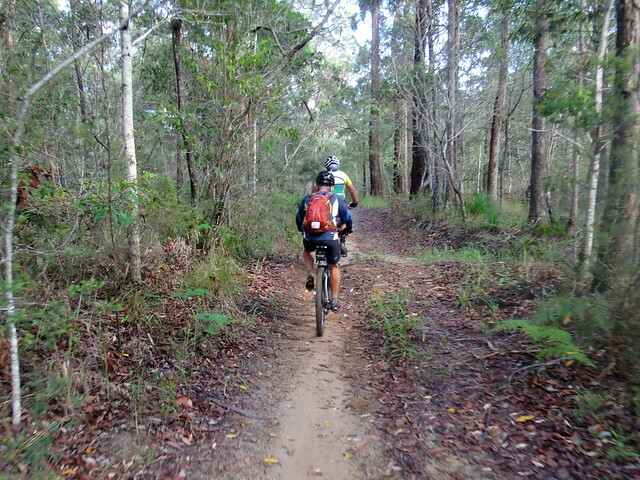 Although many narrow single-tracks branched off into the trees, we decided to stick to the wider tracks. 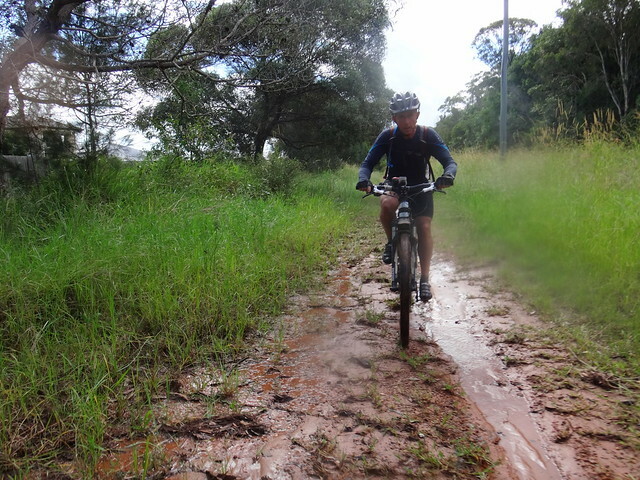 Some of the causeways were a bit wet, but we were lucky enough to be able to avoid most of the thick mud. In the distance, hints of the Glasshouse Mountains peered out at us from behind damp trees. 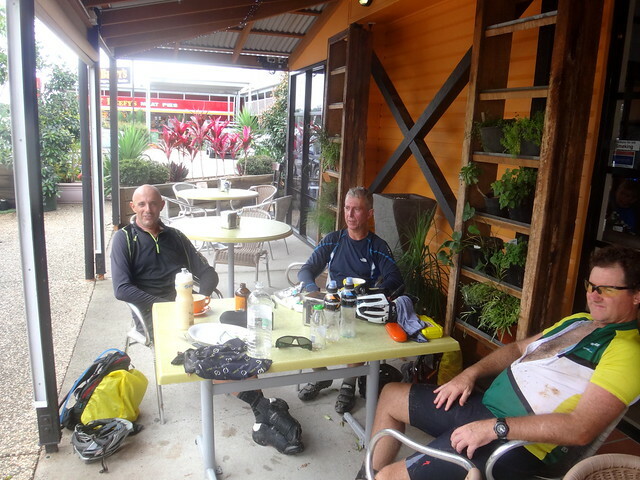 At Wildhorse Mountain we hosed the bikes down under a firehose, then stopped for a quick snack at one of the cafes. Our bikes were cleaner than we were. The tracks north of Wildhorse Mountain were quite wet. Floodwater followed the course of the road. 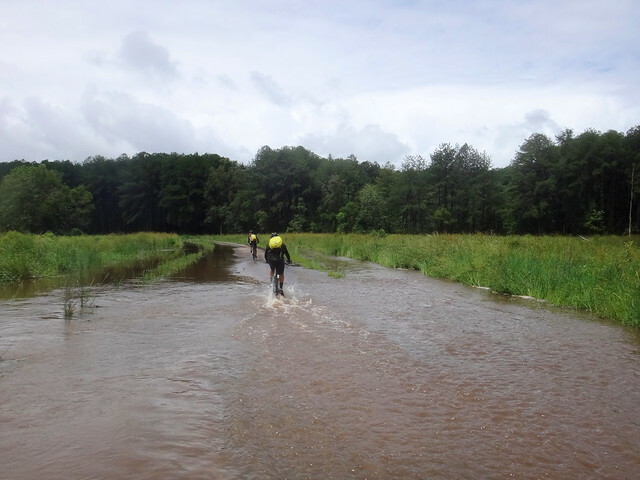 It was like riding along a creek bed. Thankfully most of the water was only ankle deep. 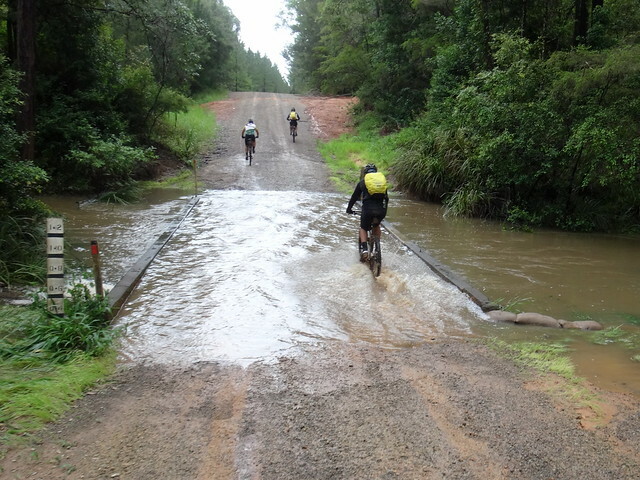 The crossing at Mellum Creek was flooded in waist-deep water. The water wasn’t flowing too fast, so we carefully waded across. Progress was slow. We carried the bikes over our heads to keep water out of the drivetrain and hubs. 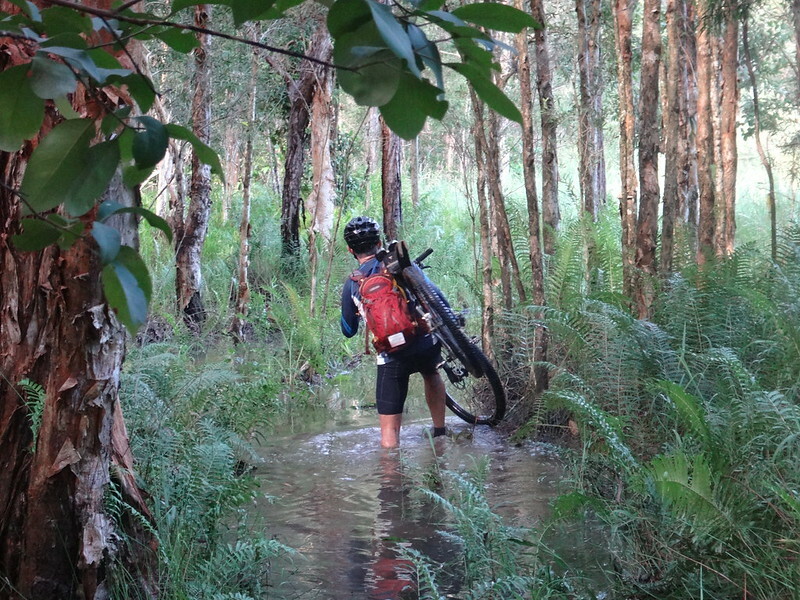 The bikes were heavily laden with our overnight gear, so they weighed a few kg’s heavier than usual. After a couple of minutes my bike started to feel really heavy. Thankfully Eric came back and helped me carry it across. Dripping wet on the other side, I was thankful for thoughtful riding buddies, and waterproof electronic devices. What followed was a very difficult trudge for half an hour through knee deep floodwater which was coursing down the track we needed to follow. Once again I tried to lift the bike to keep the hubs and drivetrain out of the water, but this made the bike feel really heavy. He grinned and understood. 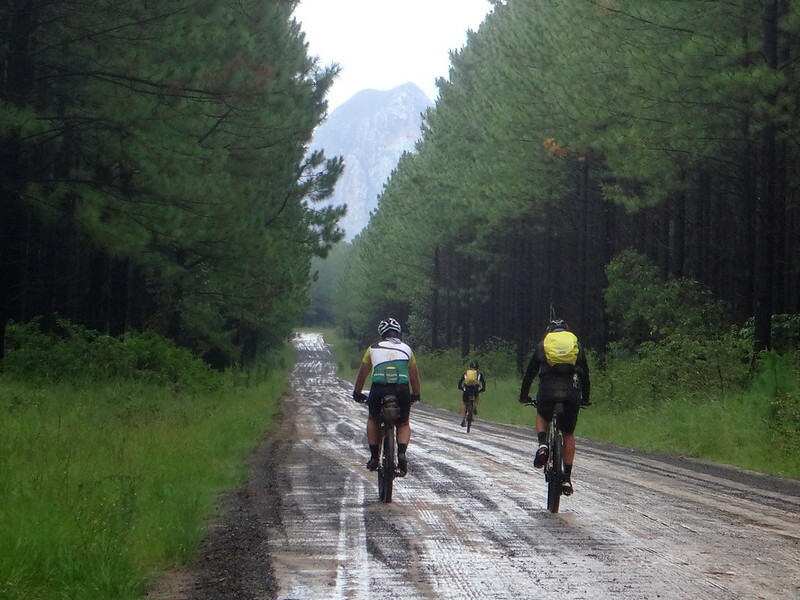 Tough rides are more enjoyable than boring rides. You forget the pain – but you don’t forget the fun. We pushed on, and eventually cleared the worst of the water. 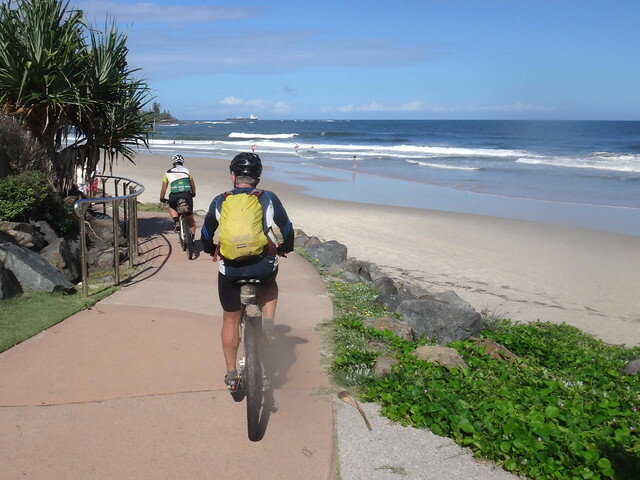 One of the difficult things about riding a bike to Caloundra is the traffic. 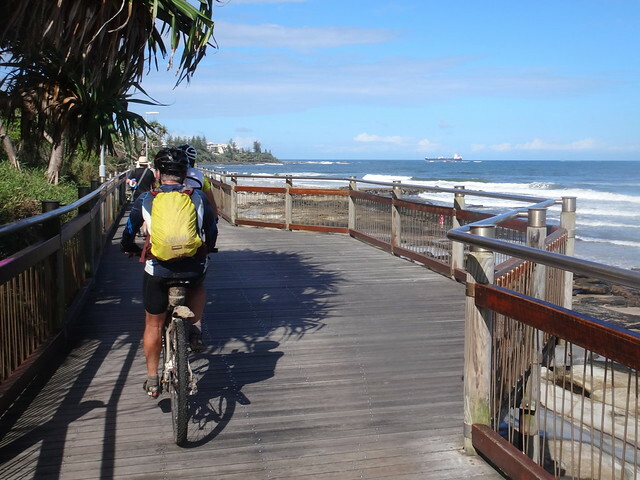 It’s easy to find off-road trails as far as the Caloundra turn-off, but in the past I’ve then had to jump on the main road for a few km and battle it out with cars. Wayne had an audacious (mad? ingenious?) idea. 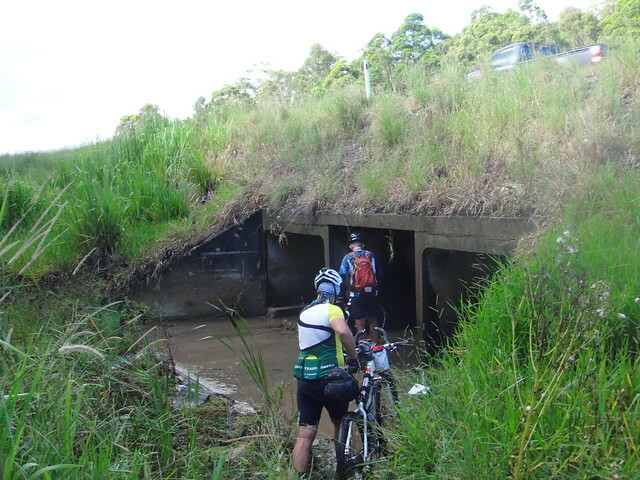 We could pass under the freeway via a stormwater drain. This would allow us to get to more off-road tracks on the other side of the buisy motorway without having to contend with cars travelling 110 km/h. Surprisingly, there was very little water in the drain – not even ankle deep. And it was reasonably high. We could walk through without having to stoop much at all. Normally I avoid stormwater drains, but this specific case was alot safer than the road. 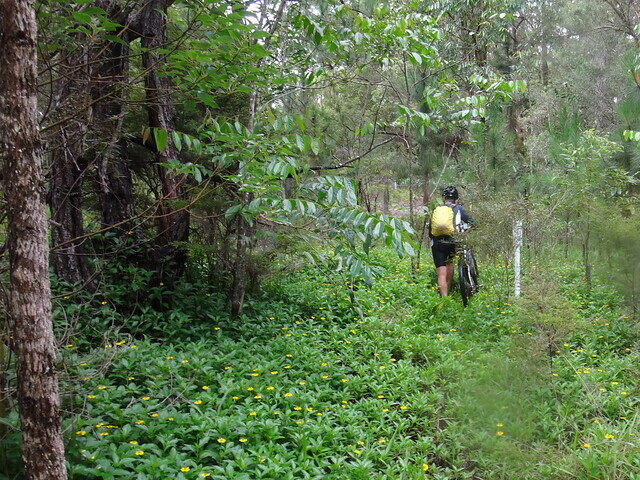 This led to some more quiet off-road tracks and bike paths which eventually brought us out near Caloundra Airport. 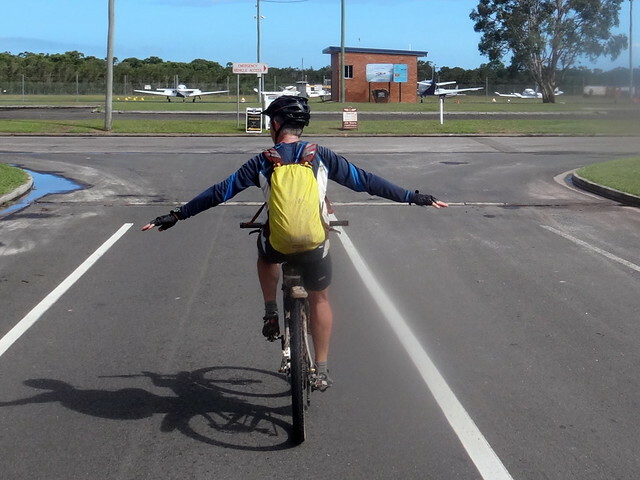 Eric flapped his “wings” for a while but wasn’t able to get airborne. 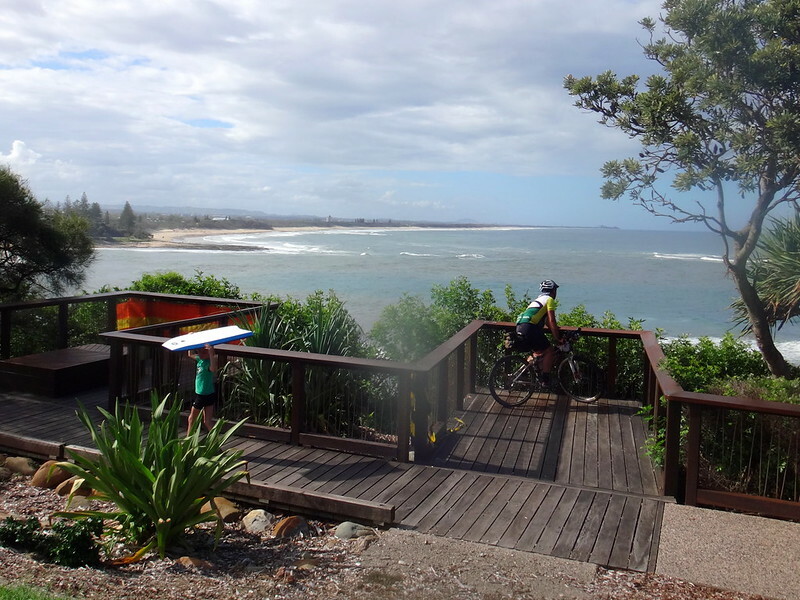 I love Moffat Beach. It brings back childhood memories of happy holidays by the beach in a crowded beach house with a couple of other families. A couple of minutes after that we arrived at our hotel. Friendly staff helped us get a hose to wash down the bikes, and huge cup of laundry detergent to clean our muddy clothes. It felt wonderful to be clean and dry again, and to enjoy a huge meal that evening. 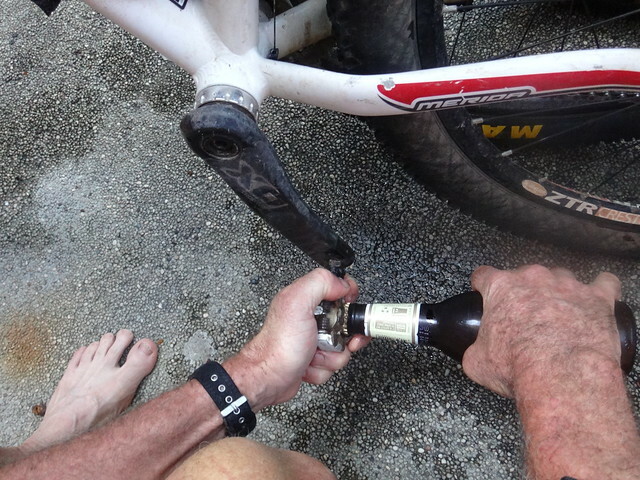 Eric showed me how to open beer bottles with Mountain Bike pedals. I think this is an important skill which I’ll find very useful in future. Plus it means you never have to pack a bottle opener. 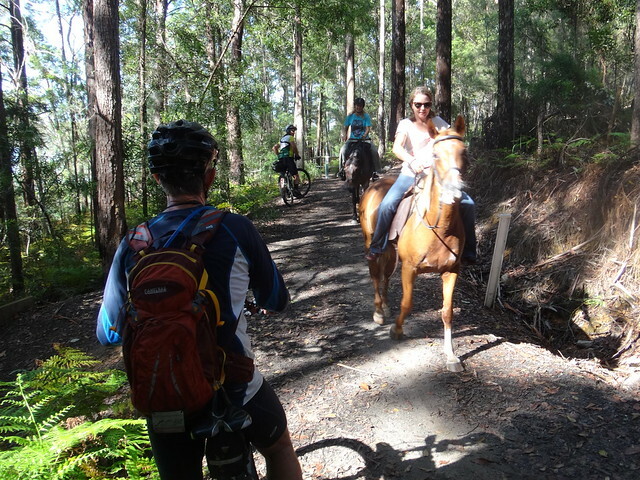 … to some fun trails around Meridan Hill near Mooloolah Cemetery. 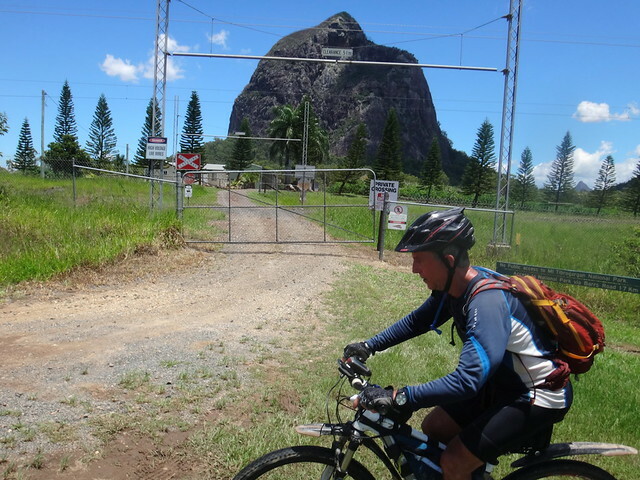 We let Eric test out some of the soggier trails, before we bailed out and travelled on the roadway for a few hundred metres. 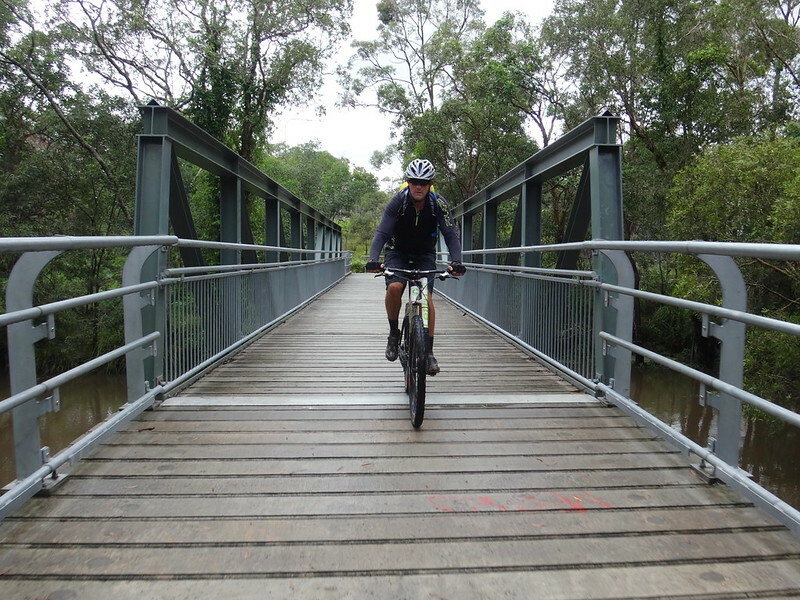 … and along twisty lakeside tracks. 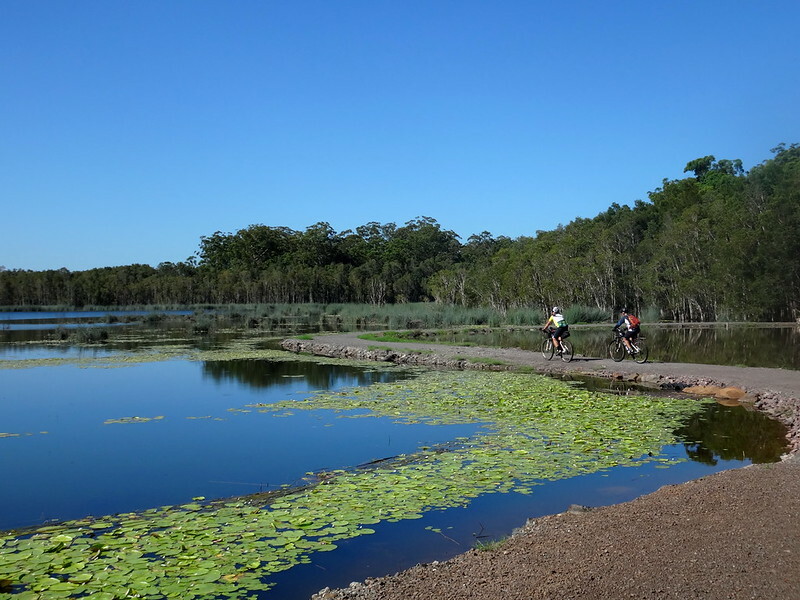 We eventually emerged from the bushland near Landsborough – the perfect spot for morning tea. 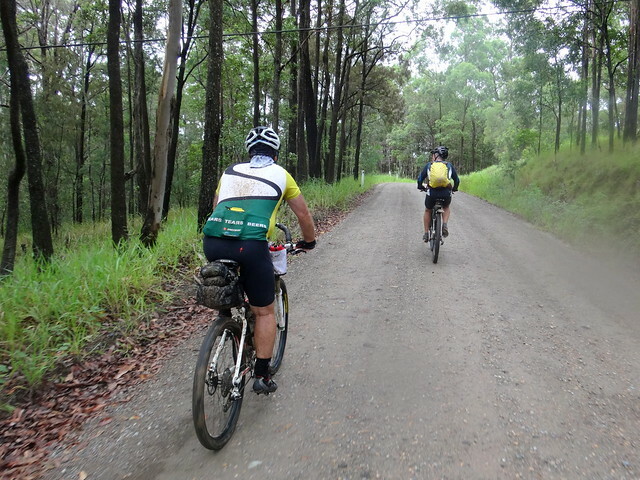 When we re-entered the pine forests east of Landsborough we started to feel tired. 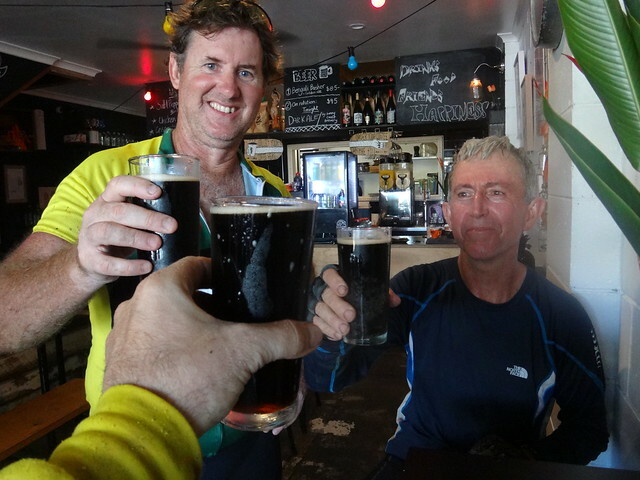 We’d ridden over 160 km in about 24 hours. 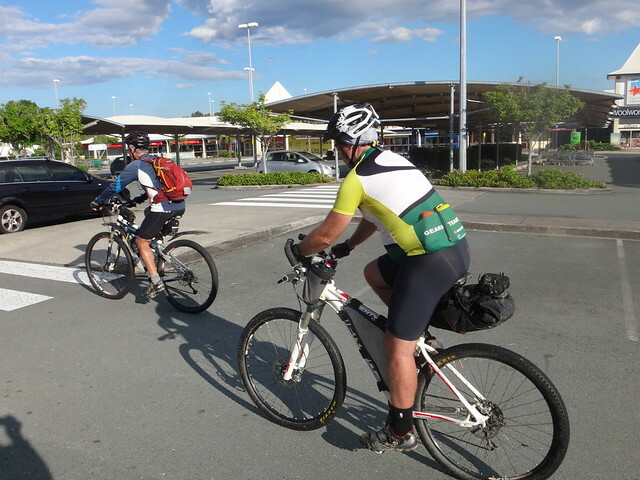 Rather than battle traffic for another couple of hourse past Caboolture, we decided to end our ride at Beerburrum Railway Station and catch the train home. Grumpy old Father Tibrogargan looked down at us from the other side of the railway track as we pedalled the final few km along the bike path. We had the railway station to ourselves. 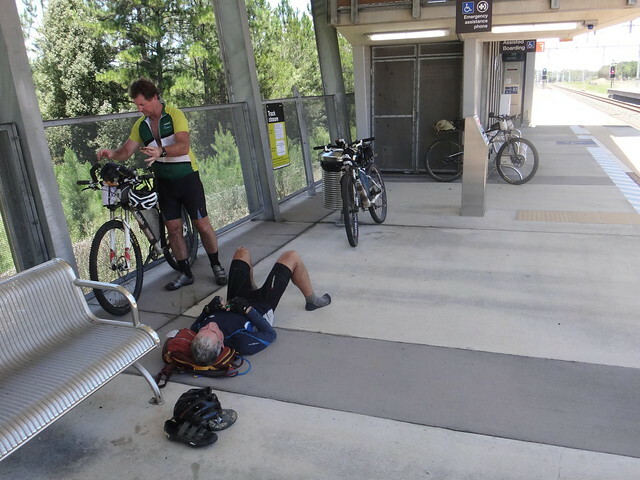 Eric decided to have a “power nap” while I laid out my shoes and socks in the sun to dry them out before the train arrived. All up we travelled about 170km in 14.5 hours. 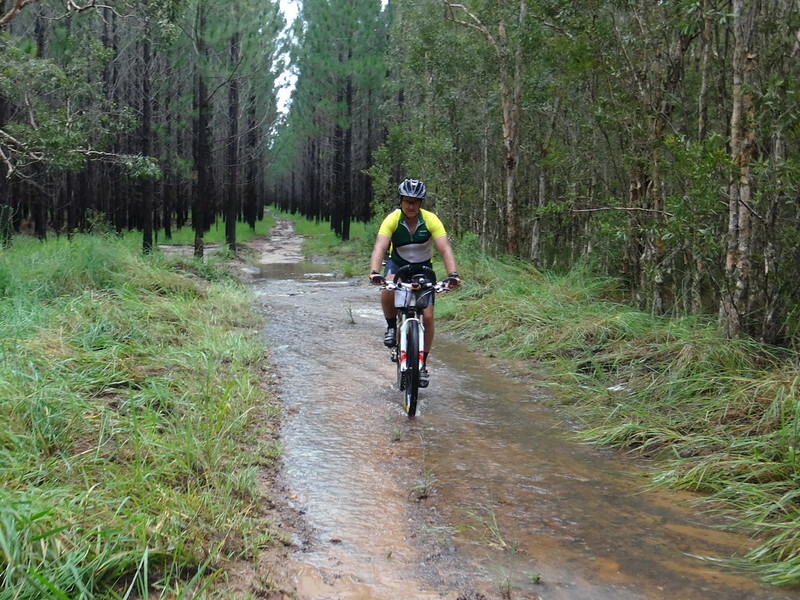 Despite the hard work pushing through water and mud, I didn’t feel like I’d done 120km on the first day. It was easier than I had expected. The second day was harder. 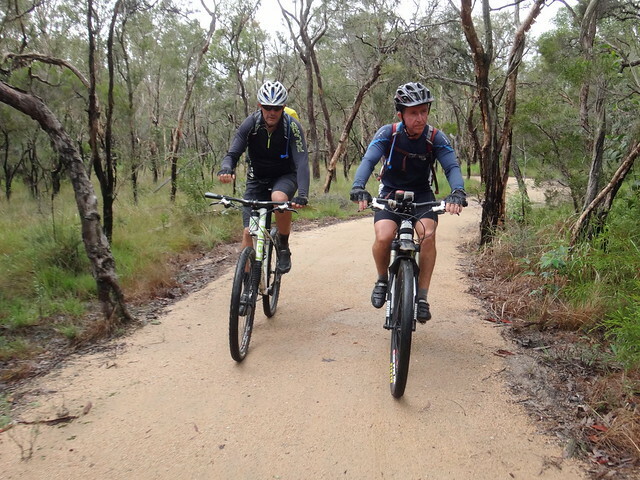 Even though it was only about 50km, I felt the hills more, and my legs hurt. Thanks Wayne, Eric and Paul for a memorable ride! 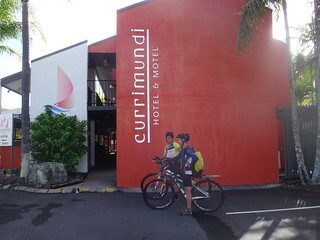 Staff at Currimundi Hotel Motel went the extra mile to help us out with laundry and cleaning our bikes. For $100/night on the coast who cares if the room was a bit dated. Clean, towels and a hot shower and reasonably priced food after. And they had a bottle shop that sold good beers. Top effort Neil. I was concerned about the creek crossings up there but clearly they were fine. 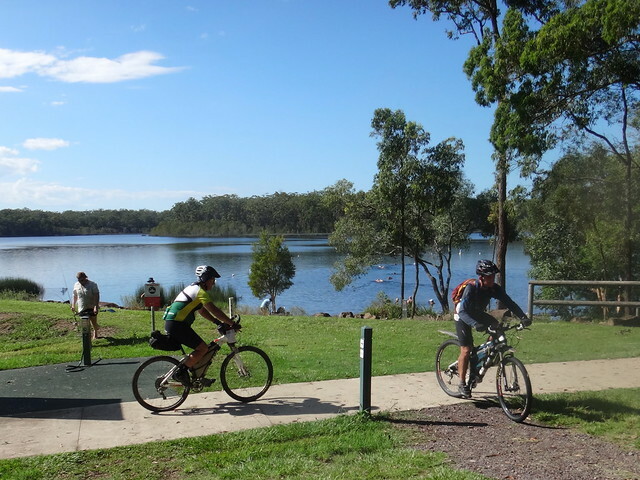 Another great ride I missed out on! Well done.